During Charles Darwin's 1831-6 voyage on the Beagle, his on-board library included 'Cook's voyages' (the edition is not specified). This illustrated 1821 edition, in seven volumes, is representative of the versions available in the early nineteenth century. 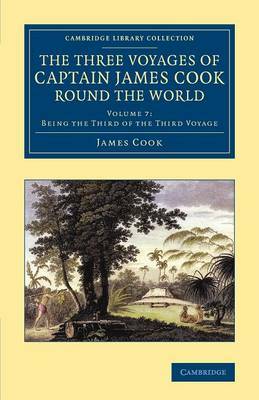 Volumes 5-7 cover the third Pacific voyage of James Cook (1728-79), which began in July 1776. Volume 7, written by James King (1750-84), Cook's astronomer and second lieutenant, first describes the events leading up to Cook's violent death, and its aftermath. In March 1779 the expedition sailed for Kamchatka to continue exploring the north Pacific for a second summer. However, the extent of the sea ice meant that in July the attempt was abandoned. The ships returned to England via Kamchatka (described in detail), Macao, Java and the Cape of Good Hope. The volume concludes with short vocabularies of Tongan, Hawaiian, and the language spoken at Nootka Sound.